Relax, let us help you! Introducing Fish-off. 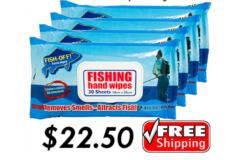 It contains fish attractant, which enhances bait or lures that you touch. 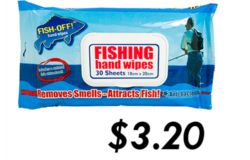 Removes the grime from your hands & really kills the stink! It also removes unwanted smells (eg SUNSCREEN) from hands before you touch bait or lures Contains tea tree oil, which helps kill germs. If you want a nice catch for the day, don't forget to put one in your fishing box. Top Ebay Seller Joins Papabazz! Did you know about this Dead Sea Secret?